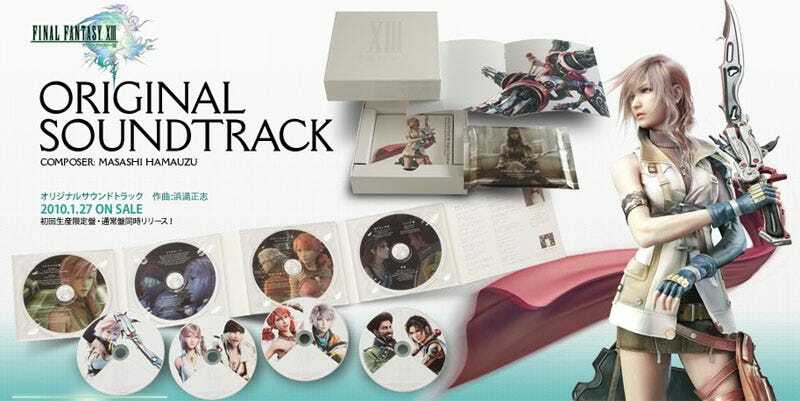 Square Enix has revealed its plans to drain even more hard-earned yen from the Final Fantasy fanatic, announcing the official Final Fantasy XIII original soundtrack. It comes in two pricey flavors, one more deluxe and limited than the other. The standard edition of composer Masashi Hamauzu's score to the PlayStation 3 and Xbox 360 game comes on four discs and in an attractive slipcase for an asking price 3990 yen (about $45 USD). The more deluxe-ified package, dubbed the "First Cut Limited Edition," features a fifth disc, fancier packaging and a heftier price tag of 5250 yen (about $58). That deluxe package costs nearly as much as U.S. consumers will spend on the full release of Final Fantasy XIII, probably a bit more when import fees are considered. But with Square Enix suggesting a retail price of 9240 yen, it seems like a bargain! If you're on the fence about importing yourself some FFXIII music, you can listen to some samples of the OST at the newly launched Japanese site.